This briefing by Martha Alter Chen and Rachel Moussié of Women in Informal Employment Globalizing and Organizing (WIEGO) explores the IMF’s approach to labour market policies, in particular to female labour force participation, in the context of women in the informal economy. Recent research from the International Monetary Fund (IMF) recognizes that macroeconomic policies can help to redress gender inequalities by creating more fiscal space for key public investments in infrastructure, education and health. Such investments reduce the time women spend on domestic chores and caring for their families, giving them more opportunities to engage in paid work. 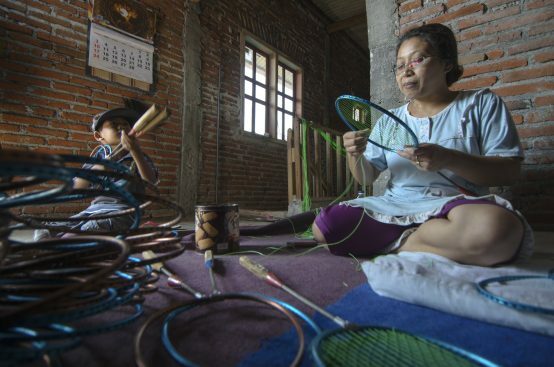 For women home-based workers, who produce goods and services from their own homes, basic infrastructure services make their homes more productive workplaces. The Fund is increasingly interested in gender inequality and the negative impacts this can have on income inequality, economic efficiency and growth (Elborgh-Woytek, et al. 2013, Gonzales, et al. 2015a). Since 2015, the IMF has begun operationalising a small part of its gender-focused research by calling for increased female labour force participation through its surveillance reports and most recently in its lending programmes. Increasing female labour force participation rates is seen as a key driver in reducing inequalities and spurring economic growth. This briefing argues that the Fund’s interest in raising female labour force participation rates does not mark a significant shift in policy, nor a commitment to addressing gender inequality. The Fund continues to promote labour market flexibilisation, restrictive monetary and fiscal targets, cuts to public spending and privatization. These policies have changed the structure of employment, weakened social protection measures previously linked to employment, and rendered social policies residual to meeting strict macroeconomic targets. Drawing on Heintz and Lund (2012), the briefing argues that IMF policies continue to delink employment from social policy, and this deepens gender inequalities rather than alleviating them. Starting from the experience of women informal workers, the briefing shows how a focus on female labour force participation rates is ineffective in addressing gender inequality if other macroeconomic policies are not also revised. Today, the share of the global workforce that remains outside the world of full-time, stable and protected employment is significant. Contrary to the predictions of many economists, the informal sector has not only grown, but has also emerged in new guises and in unexpected places (Chen 2012). Most workers in the Global South, women and men, are in the informal economy, and informal employment is a greater source of employment for women than men in South Asia, sub-Saharan Africa, and Latin America and the Caribbean. While some informal operators enjoy high earnings, informal employment is overwhelmingly characterised by low pay, insecure, and vulnerable employment, without access to work-related social protection. Informal workers face greater decent work deficits than formal workers across the four key pillars of the Decent Work Agenda – employment creation, social protection, rights at work, and social dialogue (ILO 1999, ILO 2002). Macroeconomic policies are not gender neutral; they can either reinforce or reduce gender and class inequalities (Grown et al. 2000, Balakrishnan et al. 2016). The labour market itself reproduces gender inequalities as women are segregated into low-earning occupations and are more likely to be in low paying informal work. Increasing female labour force participation rates without increasing decent work opportunities pushes more women into the informal economy or vulnerable employment in the formal economy. Rather than contributing to women’s economic empowerment, this can lead to rights violations and entrenches existing inequalities based on gender, class, race, caste and ethnicity. Sub-Saharan Africa, for instance, has the highest female labour force participation rates alongside the highest rates of gender inequality and poverty (Dieterich, et al. 2016). 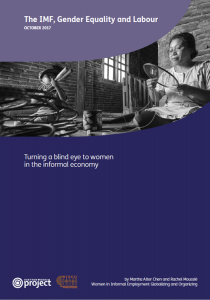 This briefing first looks at the size and structure of the informal economy from a gendered perspective, as this is where most women work to earn an income. We recognise that the formal and informal economies are intimately linked and that many workers move between the two; however, our analysis is restricted to women working at the base of the economic pyramid in the informal economy to illustrate our key points. Second, it assesses the Fund’s policies on delinking employment from social policies and the impacts this has on women informal workers in the Global South. Finally, it explores a few alternative policies that can create more decent work opportunities for women in the informal economy and move towards greater equality.